This came in the mail yesterday, along with a new gathering foot for my Bernina! I haven’t used it yet, but I have given it a thorough look-through. Nancy Langdon and Sabine Pollehn have put together an amazing sewing book with fantastic photos and very clear, easy to follow directions. 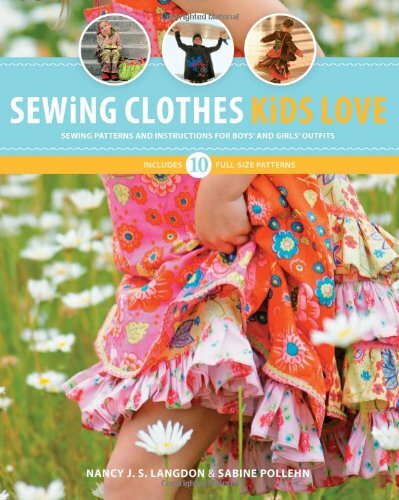 It also looks like a good book for spring-boarding other ideas from; she gives you direction for measuring your child, how to alter patterns to your child’s measurements, and how to make a dress-form of your kid with duct tape! I’ll have to report back when I finish making something, but I’m very excited about this book and getting busy. Can’t wait to see what you can create though. It will be amazing. I hold no doubt! By the way…I want a new monster! I am not always this grouchy! Note to self: MUST. BUY. THIS. BOOK! I’m trying not to envy you your skills. You worked hard for them. You will make amazing things, I have no doubt. Is this another sewing book that I will have no use for until I have a girl? I’m developing quite a list…. Learning how to make a dress form from duct tape makes the book worth buying even if you sew for adults. The only problem with sewing cute little girls’ clothes is that they grow out of them so fast! On a completely different subject – I noticed your twitters about B vitamins making you sick. I take mine after dinner with a huge glass of water and all is well. If I take them in the morning forget about it, the day is gone because of stomach upset. They, along with a few others like vitamin E, feverfew, and magnesium (all combined into a supplement called Migra lief) have kept my headaches and migraines under control for the last 4 months. About once a week I still have to get out the big guns (Rx). This looks awesome! Tracy, that’s so exciting. Please post pictures of the things you make. You’re like me and get really into designing stuff. I bet it’s going to look fantastic like all your stuff. My new craze is quilting. I’m a total beginner and have nobody here locally to teach me. I know you guys all have lots of experience so please share your knowledge with me and let me know what are the pitfalls that beginners often fall into, as well as the shortcuts and tips that you discovered as you learned. I’d really appreciate that. I remember it was one in your Houston display booth. Tracy, what’s your email? I thought I had you in my address book but I don’t. Being able to make a dress form from duct tape is great for sewing clothes for anyone. The book looks very cute. This is so sweet, thanks for sharing with us.